Artist's rendering of 'Oumuamua by M. Kornmesser, care of the ESO. 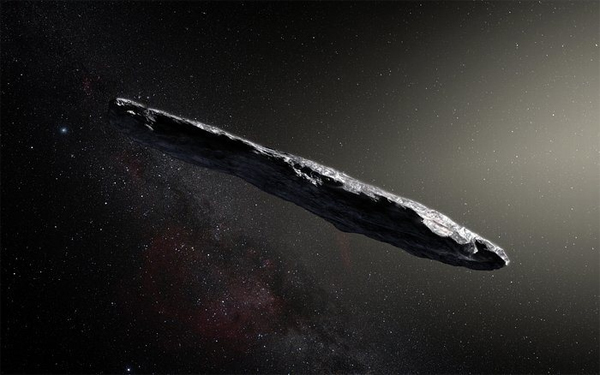 I love this article by Nicole Mortillaro for the CBC about 'Oumuamua, the "bizarrely shaped" interstellar asteroid "ejected from another stellar system, just passing through ours." Mortillaro, who is the CBC's Senior Science and Technology Writer, writes in a way that makes her subject eminently accessible to the average reader, and right in her bio is something that strongly resonates with me: "As an amateur astronomer, Nicole can be found looking up at the night sky appreciating the marvels of our universe." This piece is particularly great, and includes a terrific interview with Michele Bannister of Queen's University Belfast, who's the lead author of a new study about 'Oumuamua (which means "messenger from afar who arrived here first" in Hawaiian). 'Oumuamua, which is about 400 metres long and 40 metres wide, raises many questions Bannister would love to answer. "I would like to know what its home star system looked like," she said. "I want another one. I want to know this object isn't unusual. Is it statistically a reasonable example of what we expect to see wandering the cosmos?" ...When 'Oumuamua was first discovered, astronomers believed it was likely a comet. That's because as stellar systems form, most of the objects thrown into space are comets, leftover bits made up of water and dust. Asteroids, on the other hand, are mostly rocky remnants and much less common. But as 'Oumuamua neared the sun, the familiar tail that comets produce didn't appear, an indication that it's mostly rock. As 'Oumuamua makes its way out of the solar system at roughly 38 kilometres a second, tumbling from end to end, researchers still aren't sure exactly where it came from. "It moves like a piece of driftwood on the tide," Bannister said. "It's really celestial driftwood." Scientists are also pointing lots of instruments at 'Oumuamua, to see if they detect anything, just in case it turns out to be an alien aircraft. And why not? Especially with stuff like this in the news! Geez, what I wouldn't give to have Hillary Clinton as president, opening up government files on the subject of unexplained aerial phenomena, and being super competent and decent so I had plenty of time to write and think about space coolness instead of panicking 23 hours of every day about what Donald Trump and the Republican Party will do to destroy us next. Which reminds me... I have lots of burning questions about 'Oumuamua, but none as urgent as this: Can I hitch a ride?